Adibatla is the latest happening place which is seeing lot of action these days. Adibatla and Raviryala come in ITIR region declared by govt recently. Several projects like TCS, Wonderla amusement park, Cognizant, Tata aerospace, Fab City, Hardware park are within a radius of 5-8 kms. Several branded developers have come out with their projects nearby as it has got tremendous growth potential and is "next hitec city in making". An investment here is going to give you fantastic returns in near future. Land rates see appreciation every three months here. Address: street no 3, Himayath Nagar, Hyderabad, Telangana, India. 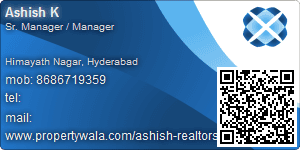 This Broker Profile page for "Ashish Realtors" has been created by PropertyWala.com. "Ashish Realtors" is not endorsed by or affiliated with PropertyWala.com. For questions regarding Broker Profiles on PropertyWala.com please contact us.